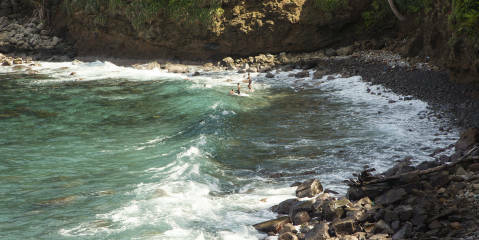 You start to pick up the smell of something delicious about a half mile to Oistins, on the south coast of Barbados. It’s too fresh, too clean to be that of the hydrogenated oils coming from nearby fast food joint Chefette or its American counterpart, Kentucky Fried Chicken. No. It’s the smell of fired-up grills searing freshly caught fish. Held every Friday night, the Oistins Fish Fry has become one of Barbados’ best loved and most popular traditions. In an open-air premises off this seaside village’s Main Road, you’ll find dimly lit stalls, each a restaurant, generally named after its proprietor. Rows of picnic tables and chairs are lined up beneath tents, with locals and tourists feasting on sustenance from the sea: plates of swordfish, blue marlin, snapper, king fish and “dolphin,” (as dorado, or mahi-mahi, is known locally). But when in the “Land of the Flying Fish,” opt for national fare. Counter to the event’s name, fish here is generally grilled, not fried, marinated in herbs, spices, oil and lemon juice, other varieties of fish hit the grill and flames roar. Flying fish is best served dusted in flour and drenched in oil. Some stalls offer “flying fish cutters” – a salt bread sandwich with fillets and all the fixings (tomato, lettuce, mayo and pepper sauce). Pair your fish with classic West Indian sides—grilled breadfruit, macaroni pie, rice and peas, the quintessential takeout-container-style coleslaw (how does it taste SO good? )—and a cold bottle of Banks (bottles are three for $5 US), and you’re set for the evening. Fried chicken and barbecued pork are available for those who don’t enjoy fish, but stick to the plan. From Mo’s Grill & Bajan Cooking to Pat’s Place, the menus don’t change much. Wherever there is a line, it’s probably worth the wait. While you’re trying to decide where to take your main meal, head to the roadside Hot Legendary Fishcakes and pick up its namesake snack: Crispy, fried dough filled with shredded salt cod, perfectly spiced and piping. Pat’s Place can be spotted by the bright orange t-shirts worn by its accommodating wait staff, who are always willing to make room for you at one of their busy tables. For a more extensive menu, try Dora and Jazzie’s Bar & Grill, which also serves shrimp, shark, lobster and chicken. Located in the center of the market, it’s conveniently adjacent to Clarkson’s Restaurant and Bar, which serves two-for-one drink deals all night. Once a year, during Easter, the Oistins Fish Fry transforms into a weeklong festival, lasting from the Saturday prior through Easter Monday. The Oistins Fish Festival celebrates a profession dear to many Bajans and commemorates the Charter of Barbados, which was signed at Ye Mermaid’s Inn in Oistins in 1652. For three days, the town is filled with vendors selling clothing, jewelry, souvenirs and more food. Established in 1977 by Lady Saint John, widow of Barbados’ third prime minister, Sir Harold Bernard St John, the festival honors the contributions of those involved in the local fishing industry. Fishing in Oistins, near Grantley Adams airport in the parish of Christ Church, isn’t just commerce, it’s art. The festival hosts competitions and demonstrations of fish de-boning, net throwing and grease pole climbing display cultural feats at the festival. Regardless of the time of year, Oistins is a town with vibrant characters, rich cuisine and good vibes. The Fish Festival is just a time to affirm Bajan culture and its contributions to the Caribbean year round. So grab a Banks, or a glass of rum punch and sizzle. For more information on the Oistins Fish Fry and the Fish Festival, visit Fun Barbados.com and plan your trip for next year’s fest here. Click here to scroll through Ola’s photos from this year’s Oistins Fish Festival.